In this article, we will discuss how to hide an application from showing up in Add/Remove Programs in Windows control panel. There is no need to download any software’s, and all we have to do is to edit some information in the registry. The Add Remove programs feature in the control panel shows us the list of all programs installed in the PC. Due to some reasons if we don’t want any particular programs to show up in the list, use the following trick to hide programs from add/ remove programs list in control panel. The program list which is shown in Add/Remove programs is collected from registry path shown below. So all we need to do is to go to that particular uninstall entry of the program and change the display name. Here I will show you an example on how to hide Yahoo Messenger from Add Remove programs list. Similarly you can do the same trick to hide programs like utorrent, Google Talk, MSN Messenger, Facebook Messenger etc. 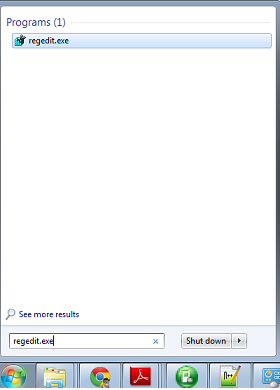 How to hide Programs from Add/Remove Programs list. 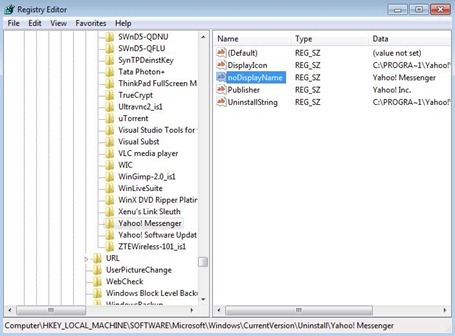 —>Example shown below explains us how to hide Yahoo Messenger. Click on Yahoo Messenger on left pane. Now you can see the options coming up for Yahoo Messenger in the right pane of registry editor. In the right pane, Select DisplayName. Right click on DisplayName and select Rename. Now change it any other value, like for example you can change it to NeverDisplayName or NoDisplayName. After completing this trick, Yahoo Messenger program will not be shown in the Add/Remove programs list. Similarly you can repeat the same trick to hide other programs which you want to hide from Add/Remove programs list, like Messengers, Utorrents, download managers etc. This hack for hiding programs from control panel will work on Windows Vista,Windows 7,Windows XP and Windows 8. Hmm..i instaled a program and i can see him on control panel but no in registry of control panel what should i do? Didn’t work. I’m using a Windows XP SP3 Home Edition 32bit. Anyone know how to hide an application on Windows XP?